Matlock and Ilkeston played out a 0-0 bore draw on a hot summers day at the DCJ Group Insurance Arena on Bank Holiday Monday. The local derby never got out of first gear with clear cut chances limited to just two, both falling to Matlock early and late in the contest. The Robins will feel far more satisfied with the point than the Gladiators. This time last week it looked as if the game would not take place with Ilkeston under a league suspension but although the visitors passing looked ring rusty, they deserved their point for their organisation and endeavour with central defenders Luke Foster and captain Matt Baker scarcely putting a foot wrong. It must be said though that the Robins were aided and abetted by some equally faulty distribution from the Gladiators. 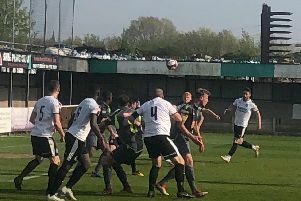 All too often the ball was pumped up high, rather than adopting the slick movement and passing from the final phase of their victory over Sutton Coldfield and in the opening half at Warrington. Perhaps conceding five goals just two days previously at Warrington played some part in Matlock being ineffective as an attacking unit. Co managers Glenn Kirkwood and Craig Hopkins had sent out clear instructions not to concede, but it appeared to be taken a little too far with Matlock often being too deep to seriously threaten the visitors defence. Adam Yates, captain in place of the suspended Laurie Wilson, saw his third minute close range effort booted off the line when it looked certain he would score. For Ilkeston Dexter Atkinson looked lively breaking forward, an eighth minute run ending with a tame shot at Arron Jameson who shortly afterwards held a drive from Jake Kenworthy. Ilkeston custodian Ross Durrant grabbed a free kick from former Robins favourite Michael Williams, one of three former Robins facing their old club, the others being home debutant Joe Doyle-Charles and Marc Newsham..
Newsham nodded wide following a bout of head tennis in the Ilkeston box to end a bitterly disappointing opening period. Ilkeston began the second half the brighter, with a sliced cross by Atkinson striking the top of the bar before the Robins striker shot goalwards and seeing Jameson initially spill the ball. Matlock’s reply was a left wing cross from Dwayne Wiley being headed over the bar by Newsham. As the game reached a conclusion Matlock looked the more likely scorers, Newsham turning to have an effort blocked by Foster before a gilt edged chancer went begging as Green’s pass across the box saw Doyle-Charles unmarked 12 yards out. But it was groans all round from the home support as Doyle-Charles pulled his shot wide. A scruffy 1-0 win would have been just the ticket from a poor game for the hosts, but in truth, the only consolation for Matlock was the clean sheet and point as hey did not do enough to earn a victory. As for Ilkeston, it’s their first point on the board after a troubled start to the season off the field. MATLOCK TOWN: 1 Arron Jameson 2 Liam Marsden 3 Dwayne Wiley 4 Joe Doyle-Charles 5 Adam Yates 6 Nico de Girolamo 7 Niall McManus (15 Andy Todd 74) 8 Michael Williams 9 Marc Newsham (12 Arel Amu 84)10 Marcus Dinanga 11 Anthony Griffiths-Junior (14 Jake Green 56) Other subs: 16 Ryan King 17 Ben Partridge. ILKESTON: 1 Ross Durrant 2 Jake Kenworthy 3 Rory Coleman 4 Danny Gordon 5 Matt Baker 6 Luke Foster 7 Luis Rose 8 Mark Shelton 9 Anthony Dwyer 10 Dexter Atkinson (16 Ben Morris 84) 11 Haydn Goddard Other subs: 12 Connor Walters 14 Ryan Head 15 Reid Owen. BEST GLADIATOR: Nico de Girolamo.